Bridget Kaye, host of the Pensacola Expert Panel, moved to Pensacola from Delray Beach, Florida in 2013. Always a performer, Bridget first became involved in the theater when she was just 7 years old. A graduate of the University of West Florida, she turned her love of performing to communications. She was active in the Broadcast Journalism Club and hosted UWF’s Stallion Morning News in her junior and senior year. She also served as Philanthropy Chair and Recruitment Vice President for her sorority, Alpha Delta Pi. 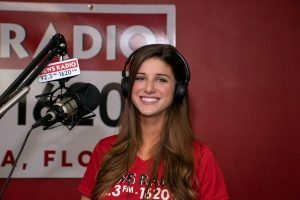 She is extremely passionate about Pensacola and also serves as the Promotions Director for NewsRadio92.3 ▪ AM1620, CatCountry98.7, ESPNpensacola 94.5 and WEBY TalkRadio99.1. She enjoys playing music, singing, local theater and of course, the beach!